Looking for a light and laser for your subcompact pistol? Streamlight is excited to introduce the TLR-6, the first small weapons light of its kind featuring a red aiming laser. 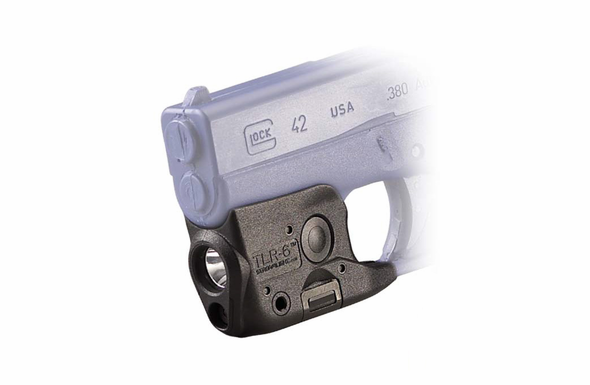 Designed for the Glock® 42 & 43 subcompact pistols, the TLR-6 quickly and securely attaches to the trigger guard. This lightweight light maximizes visibility and targeting capability in a variety of home defense and tactical applications. With a parabolic reflector to produce a balance of beam and peripheral illumination, the TLR-6 delivers 100 lumens, 2,000 candela and a beam distance of 89 meters. It also uses a 640-660 nm red laser. Batteries can be replaced while light remains mounted on gun. No need to re-sight laser after battery change.